Craft brewing is big in North Carolina, and getting bigger. In Western Wake County, two craft breweries were operating in 2010. By the end of 2015, eight companies were brewing artisan-style libations. Two more plan to open this year. A bartender at Bombshell Beer Company in Holly Springs pours a draft. One of the brewery’s founders, Michelle Miniutti, says there are many styles of local craft beer to choose from. “It’s not just big, brash IPAs,” she says. According to ncbeer.org, our state has more breweries than any other in the South; since 2010 the number of N.C. craft breweries has more than doubled. Ten years ago, then-Gov. Mike Easley signed legislation raising the alcohol limit on beer sold in the state. This change, and other adjustments favorable to small breweries, laid the groundwork for this beer boom. But with all the new breweries, it’s not easy to stay on top of the scene; this brief guide will help. Bombshell brews have garnered praise since friends Ellen Joyner, Jackie Hudspeth and Michelle Miniutti opened the Holly Springs brewery in 2013. The women-owned microbrewery may be unique in North Carolina, but Miniutti says the beer is what counts. Customers enjoy a beverage at the Bombshell taproom in Holly Springs. Its Dirty Secret Stout was named one of the state’s best stouts by drinkmicro.com in October, and Cary Magazine readers voted the brewery a Maggy Awards honorable mention this past January. 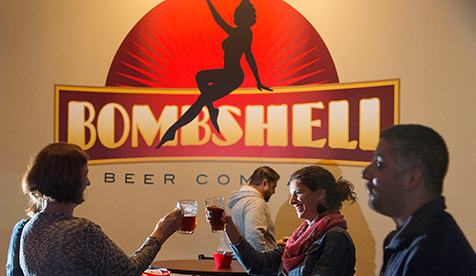 The inviting taproom, well-educated servers, and weekend events add to Bombshell’s appeal. The owners particularly want women to feel comfortable in the space. Lori Sowers, left, and Ashley Mussig enjoy a Friday evening at Bombshell with Bruno, and his little pal Bella. Educating drinkers who may think they don’t like craft beer is key to expanding the market, she says. Partnerships with local restaurants and exposure at festivals have helped folks discover Bombshell’s “easy-drinking, approachable beers,” Miniutti says. She hopes to gain further exposure as the company starts canning its beers later this year. European and Latin American food from Route Bistro Truck is the perfect compliment to a Bombshell beer. The Green Plantain Bowl, front, includes pork carnitas, guacamole, pico de gallo, sauerkraut and rice. 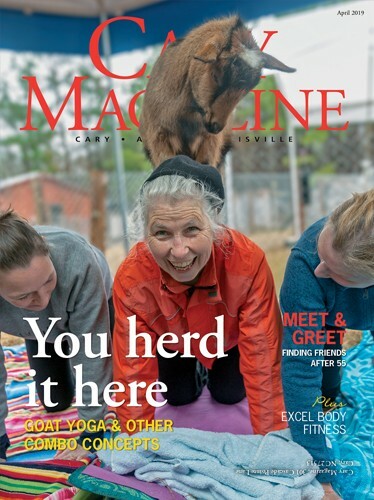 Nanobrewery Fainting Goat produces a limited number of beers, allowing owners Tim Reichert and MaryAnn Durborrow to concentrate on each small batch. The pair brew three nights a week to supply customers from Thursday to Saturday. Recommended: Since opening in October 2015, their most popular beer has been What the Buck Pale Ale. Reichert suggests visitors also try the Pomegranate Tart Belgian Witbier, brewed with local wildflower honey and finished with pomegranate juice. Richard Camos already owned a bottle shop in North Raleigh and two Camos Brothers Pizza restaurants when he opened Lincoln Brewery in June 2015. The Fuquay-Varina brewery has a full bar, a game room and 24 taps dispensing its own beers and a variety of other craft brews. Food is available from the nearby Camos Brothers Pizza. Owner Eric Wagner is an engineer by trade, with a former career in water treatment. He opened Apex’s first brewery in 2014 after years of brewing on the weekends and thinking about brewing the rest of the week. Bartender Mary McLachlan performs a card trick for customers Mike Baycura, center, and Bill Laundon at Brüeprint Brewing Company in Apex. “I’m doing what I want to do,” he said of the business. In his four year-round beers, and several more seasonal and small-batch brews, Wagner aims for balanced and refreshing beverages. The Brüeprint name came from founder Eric Wagner’s background in engineering. “Better than a recipe, a brewing blueprint combines science and great culinary skill to create a Brüeprint,” he says. An avid home brewer, Brüeprint founder Eric Wagner had a hunch a brewery would be a hit. “People were drinking all my beer, so what was the point of home brewing?” he says. He also wants to promote a relaxed, community-friendly atmosphere. The open, airy taproom has televisions, cards, board games, a foosball table and chairs arranged to promote conversations. Events are scheduled throughout the week, with music and food trucks on the weekends. Wagner is pleased the local beer scene is growing, and he wants consumers to take advantage of the wealth of choices in craft beer. Each brewer has something different to offer, and each beer is unique, he says. “When you make a beer, you put your personality into it,” he said. Recommended: Wagner suggests a beer flight, which includes a pale ale, amber ale, brown ale and Scotch ale. Cary’s first brewery was founded in 2014 by fans of English brews, who wanted to bring a bit of the United Kingdom to North Carolina. 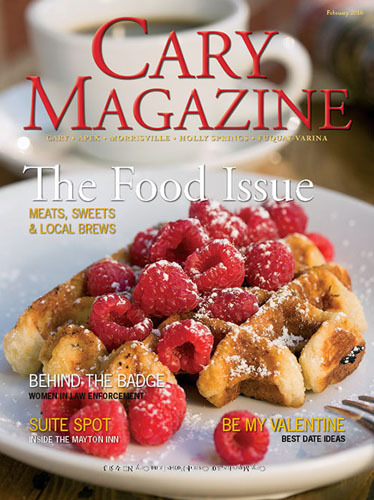 Fortnight soon gained a loyal following, with the brewery collecting Cary Magazine Maggy Awards honorable mentions in 2015 and last month. Their core offerings include English Ale, Porter and ESB (Extra Special Bitter). Fortnight also offers a Blonde Ale, an IPA and several seasonal and small-batch releases. Beer can be sampled on draft at “American” temperatures — around 44 degrees. Fortnight also serves from casks, the traditional English method, resulting in less carbonated beer served around 55 degrees. Last year, Fortnight started canning its beer; six-packs are now available at local grocery and wine stores. Renovations to the taproom began in January, and expect to see an outside seating area this year. The company also plans to expand the variety of beers, adding some that will only be available at the brewery, says Stuart Arnold, president. “I like that the craft beer movement is growing in our area,” Arnold said. Alongside the core beers, Fortnight plans to make a wider variety of beers and offer them only at its brewery and taproom. Scott Wood and Scott Palmieri hit it off when Wood built Palmieri’s house in Holly Springs. The two beer lovers started brewing and eventually graduated to a 40-gallon homebrew operation in Palmieri’s garage. Brewer Jamie McMillan walks among the brewing tanks. Automation helps Draft Line keep tight control of the process and maintain consistent product quality. They tried to mimic the laid-back environment of that garage when they opened Draft Line in June 2014. The 10,800-square-foot facility in Fuquay-Varina houses a wide oak bar in front of the 30-barrel brew house. Co-founder Scott Palmieri, left, lifts a pint with McMillan in the garage-style taproom. Draft Line offers six brews year-round, with additional seasonal beers and weekly specials. The Deep Plunge Porter, Hemmings Pilsner and Vienna Lager all won honors at the North Carolina State Fair’s Brewers Cup — the porter and pilsner in 2014, the lager in 2015. “The beers are designed to appeal to a large market, but be true to style,” said Palmieri. He adds that attention to the ingredients helps maintain a consistent product. “I want to drink the same pilsner I had three months ago,” he said. The award-winning brews at Draft Line are Hemmings Pilsner, Vienna Lager and Deep Plunge Porter. The company plans to start canning its beer this year, enabling Draft Line to expand distribution beyond restaurants and bars into grocery stores. Beers: Aviator’s most popular offerings are Devil’s Tramping Ground Tripel, Hogwild India Pale Ale, Mad Beach American Wheat and Black Mamba Oatmeal Stout. About a dozen more seasonal and specialty beers are made throughout the year. What’s new: Doble expects to have a distilling permit by March, expanding the Aviator brand into vodka, gin and moonshine. The Aviator Event Space is expected to open soon, and improvements to the Smokehouse and the Tap House are in the works. Doble is also working on plans to move the brewery to a new 5-acre site in downtown Fuquay-Varina. Beers: Carolina Pale Ale, India Pale Ale, Carolina Brown Ale and Hop Roar West Coast Style IPA are available year round. CBC also brews several seasonal and specialty releases. What’s new: After 20 years of brewing, CBC opened a taproom at its Holly Springs facility in September 2015. Maple used in the bar and tables adds warmth to the former retail space. About 35 can sit inside, and outside patio space is available too. Heath says they will add live music and food trucks later this year. He also says to look for more bourbon-barrel aged and nitro brews from CBC. Cary’s second brewery, Bond Brothers Beer Company, is expected to hold its grand opening in April, but co-founder Jay Bond says the company will open the 2,300-square-foot taproom by mid-February. “Or as soon as we have beer to serve,” he said. He describes its brews as “old school classics and new school originals” and expects to have eight to 12 beers on tap in a variety of styles. Jeremy Bond, Andy Schnitzer and Whit Baker make up the rest of the Bond Brothers team. Longtime friends and business partners Ken Michalski and Nathan Poissant expect to open Southern Peak in late February or early March. They plan to initially offer five to six beers, working up to eight or nine in rotation. The partners plan to host live music in the 600-square-foot taproom, and eventually food trucks on the weekends.